I.N.K. : JOSEPHINE rocks, and so does her author! JOSEPHINE rocks, and so does her author! Thanks to my occasional INK book reviews, I sometimes get presents from publishers. Opening an envelope from Chronicle and seeing JOSEPHINE by Patricia Hruby Powell, illustrated by ChristianRobinson, nearly took my breath away. When I began reading it, I had to sit down to still my heart. Which is rather counterproductive because Powell’s book is all about dancing! It’s a gorgeous book, with text, artwork, design perfectly matched. As a biographer, I’m delighted to see it expand the genre of picture book biography. To learn more about the genesis of Josephine, I asked author Patricia Hruby Powell – a professional dancer herself – a few questions. 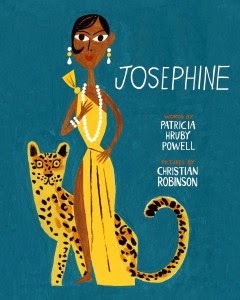 Josephine: The Dazzling Life of Josephine Baker breaks a lot of boundaries. It is a 104-page picture book biography divided into chapters, 3800 words long – way beyond usual picture book length. Is this the length and format that you had in mind before you began writing? No, not at all. It began as a picture book, 1475 words long, which is too long for a PB, so I got it down to 1000 words. After taking it to a workshop I revised it as a 7500 word book for YA, imagining b & w illustrations along the lines of the Paul Colin poster art whose work helped launch Josephine’s rise to fame. I know, there’s really no such brief illustrated YA genre, but I was writing what impassioned me. That odd manuscript won me my agent. 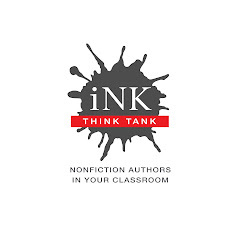 After we received many complimentary rejections, my visionary editor-to-be at Chronicle Books asked if the author would cut it down to about 3000 words and make it younger for a picture book reader. I got it down to 3400 and that manuscript was purchased by Chronicle and in the editing process we added back some stanza/paragraphs. The SLJ review lists it for grades 2-4, Booklist, for grades 5-8. What do you think? I think it works for 2-4 and 5-8 and even high school. I know it’s being used for all those ages. This book is so rich and multi-layered. It’s the story of one African American woman’s life. It’s the story of the racial climate of the U.S. vs. Europe. It’s the story of the evolution of an artist. What drew you to JB? Any dark nights of the soul along the way? Way back in 2005, while on duty as a children’s librarian, I got to know a group of unfocused African-American preteen girls who showed up daily and pretty much wreaked havoc in the library. 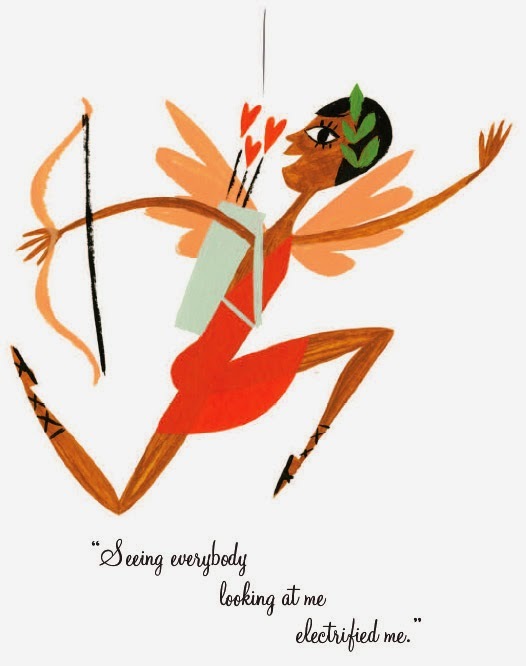 I thought Josephine Baker would be a great role model—with her high spirits which she channeled into great success (dancer, singer, star, civil rights worker, pilot, spy for the French, mother of 12). As I said, JOSEPHINE won me my agent at the end of 2009, and the book sale in 2010. At that point there was not really an awful lot of editing to do except for adding stanzas back in and tweaking here and there. Darn those dark nights of the soul. We must talk about that. Did you always intend to write in free verse? Yes and no. The language was always razzle dazzle, but the line breaks came over time. What you write evolves, and as the words became more rhythmic I followed that rhythm and it became more important over several drafts. And the line breaks enhanced the understanding and the rhythm. You’re a dancer, so you have a deep understanding of body and rhythm. Did you dance while you were writing this? I did dance while I wrote—occasionally—I mean I’m always dancing. If you dance for a lifetime or if you’re born wanting to dance, the rhythm just lives inside you. I watched early footage of the magnificent young Josephine and was wowed. I tried to translate that into words on the page. The design and illustrations are glorious: the bright colors, the typography, the illustrations showing figures against a blank background. Were you involved in any of those decisions? I was, actually. I had veto power over the publisher’s illustrator choice—a privilege rarely given to a non-star writer. Later, after Christian Robinson was chosen, my editor and I would sit over his early sketches (sent online) and we discussed the accuracy, the energy, the placement in the story—all very cool. And then we worked together on the placement of words on the page (how they sometimes cascade down the page) and the “shout out” words—those in caps. The designer got the final word, but I got to participate in that. What a great experience. I love Chronicle and I love my editor (who is way too busy so I’m keeping her name under tabs so we can get back to my next piece together ;-). And the publicity people and the designer--great. And I love Christian’s illustrations. Just magnificent. 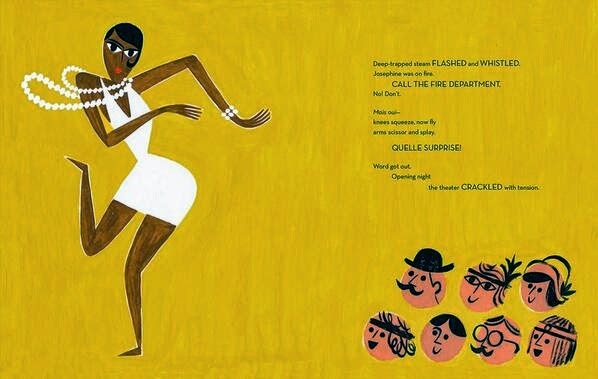 How do children respond to the book, and to your dancing the Charleston for them? Kids appear to be mesmerized by the book. I love seeing black kids seeing themselves in the illustrations. As for dancing, it certainly draws their attention. In our culture we don’t do enough dancing. I always encourage kids to dance. And to draw, paint, sing, write, tell stories, anything that offers self-expression. I’ve done a couple events where we’ve all danced together. Very fun. Did your research on Baker lead to other book projects? Struttin’ With Some Barbecue – another biography in jazzy verse about Lil Hardin Armstrong, jazz pianist and composer, Louis Armstrong’s wife – has not yet sold, but I think it will. Loving vs Virginia is scheduled to come out with Chronicle in Fall 2015. This is a documentary novel for teens in verse about the interracial marriage between Mildred Jeter (black) and Richard Loving (white) in 1958 Virginia, when miscegenation was illegal. It’s a beautiful love story set against a backdrop of the civil rights movement. 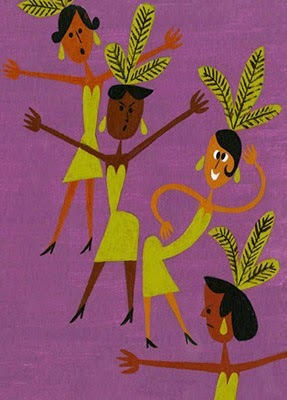 I have a couple of other picture book biographies in the works and I look forward to getting back to a jazz age novel. Thanks for asking, Gretchen. For the story of the Christian Robinson’s illustrations, including post-it sketches and paintings, click here.